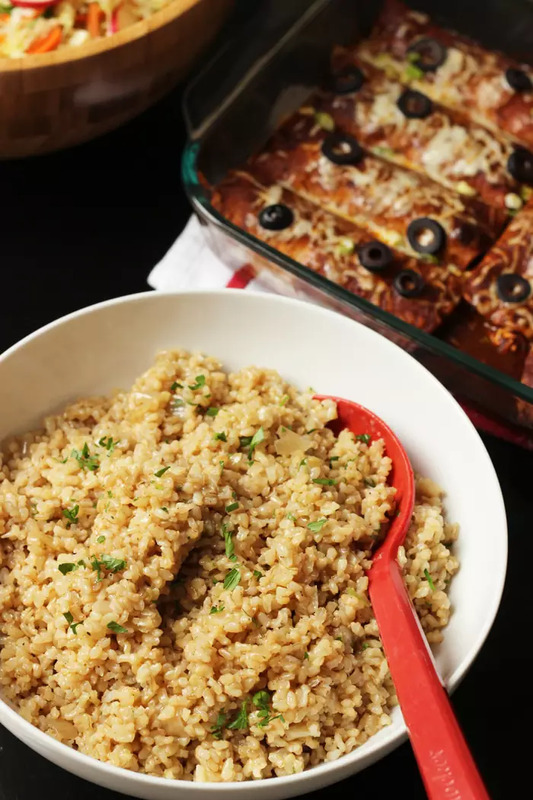 Serve up an easy side dish tonight with this Simple Brown Rice Pilaf. Based on whole grain and packed with flavor, it’s a great supporting actor. 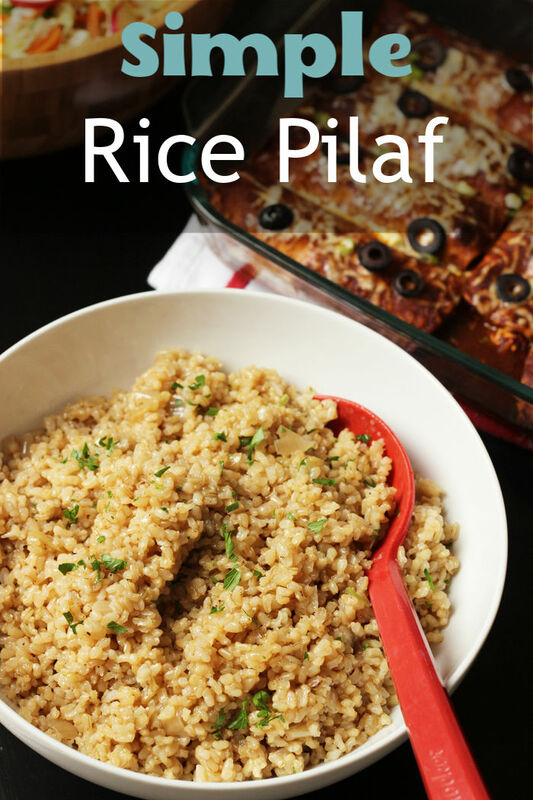 Rice pilaf is one of my go-to side dishes. Hubs could eat the whole pan himself. There’s just something about the combination of butter, onion, rice, and chicken broth that comes together in a happy, comforting way. While I’ve made rice pilaf plenty of times with white, long grain rice, I’ve been making it more and more with whole grain brown rice. The texture is a little different, a tad stickier than when made with white rice. What Is The Difference Between Rice And Rice Pilaf? Usually rice is cooked in water. It can be steamed, boiled or baked. Rice pilaf though varies in the preparation of the rice. It is usually sauteed first in butter or oil. Then it’s cooked in a stock or broth. 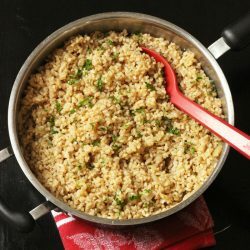 How Do You Make Brown Rice Pilaf? In a large skillet with a lid, melt the butter over medium heat. Add the rice and onion. Saute until the rice the becomes opaque and the onion starts to become translucent. Add the chicken broth and parsley and bring to a slight boil. Cover and reduce the heat. Cook for 40 minutes, covered, until the liquid is absorbed. Fluff with a fork, season with salt and pepper, and serve. One glance at this recipe and you’ll know you’ve got the real deal. When possible I use homemade chicken stock since it’s so easy to make and practically free if you’re already roasting a chicken.There are no mixes or bottled sauces here. Just real good food! Buy in bulk. I know that Costco is the best place to buy ingredients in bulk, like brown rice or chicken stock, when there isn’t a great sale elsewhere. I keep track of prices so that I know who has the best deal where. If you don’t think you’ll eat through a ten pound bag of rice too quickly, split the purchase with a friend or store the extra in the freezer to extend its shelf life. Yes shopping at Costco can save you money, if done right. Make my own stock. Homemade chicken stock is so easy to make and practically free if you’re already roasting a chicken or buying rotisserie chickens. Extract all the flavor from the bones before you toss them. 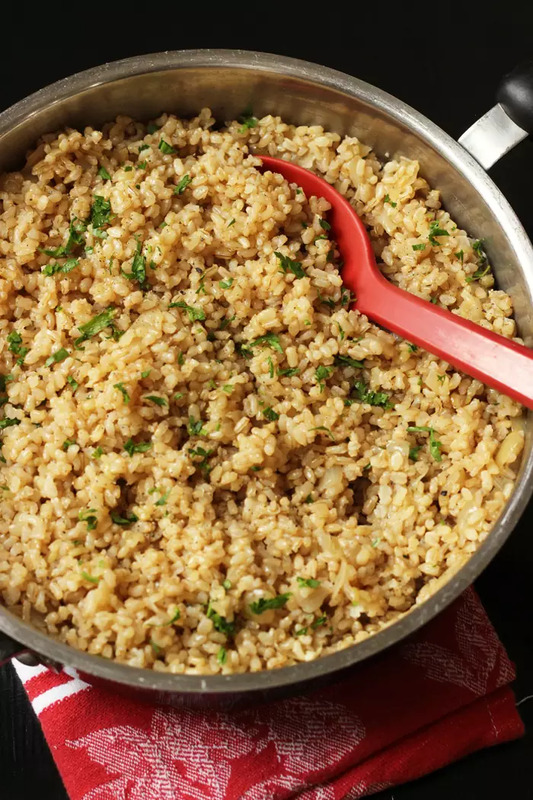 Serve up an easy side dish tonight with this Simple Brown Rice Pilaf. Based on whole grain and packed with flavor, it's a great supporting actor. Buy in bulk. I know that Costco is the best place to buy ingredients in bulk, like brown rice or chicken stock, when there isn’t a great sale elsewhere. I keep track of prices so that I know who has the best deal where. If you don't think you'll eat through a ten pound bag of rice too quickly, split the purchase with a friend or store the extra in the freezer to extend its shelf life. Originally published November 22, 2010. Post updated March 25, 2017. Saw this post and since I hadn’t planned dinner yet, I made this and threw some salmon on the grill. It was delicious. Thanks foe my new go-to rice recipe! Isn’t it easy? Thanks for letting me know how it worked for you! Would you still cook the rice 40 minutes if you use regular white rice? No, if you’re using white rice, reduce the cooking time to 20 minutes. Another great recipe easily converted to veg by using vegetable broth and a little salt! Delicious! We had this for dinner tonight. I sauted the rice & onion in a skillet and then cooked the rice, onion, broth, and parsley in the rice cooker. The rice cooker clicked after 40 minutes. The rice is tasty but a bit al dente. My guess is the stove top works best but the rice cooker works well too! And no, it wasn’t an extra dirty pan by sauting the rice & onion stove-top as I used the skillet to cook up our veggies. Yum! We just had this for dinner tonight and it was delicious! I did half the recipe since there are just 4 of us and that includes a 1 yr old and 4 yr old, but it was really easy to put together. I used fresh parsley because I didn’t have any dried parsley. Definitely a new go to side dish for us!! I made this a couple weeks ago to go with baked chicken and it was delicious! Last night, I used this recipe as a starting point and created a Mexican version to go with enchiladas. It turned out really well, and I will be posting it on my blog soon, with a link to your original recipe, of course! I have no idea how I missed this. Rice pilaf is a new favorite side dish here. I make mine pretty much the same except after the liquid has come to a boil I carefully transfer it all to a casserole dish then cover and bake it in a 350 or 375 degree oven. Tried this tonight…yum! I made mine with 1 c. brown rice and 1 c. orzo pasta, and it came out great! Thank you! @Sandra, I just bought some orzo. Gonna have to try that! FYI, when I try to click the “Print This Recipe” link, it just prints a blank sheet. It loads fine for me. I’m not sure what the problem is. This sounds good. Going to make that inside while we grill Asian marinated chicken with some red pepper and zucchini. It serves six to eight. That’s okay! Use what ya got. I call that a win! How many does this recipe serve? I wish there was nutrition info, but I can figure that part out. Four to six, depending on what else you’re serving. Tell me what type of brown rice you use? And also what type of orzo rice you use? I have never bought any of them. Please and thank you. I typically buy long-grain or basmati brown rice. And the orzo is whatever Trader Joe’s carries. It’s a pasta. I don’t think so. You’ll need regular long grain rice. You can use white, just decrease the cooking time to 20 minutes. I weaned my family from only white rice to our go to mix now of half white and half brown rice. I gradually added a bit of brown rice to recipes and over time the family got used to the 50/50 mix. I tried this recipe, adjusting the time a bit. No leftovers. So glad you liked it. My family doesn’t particularly comment when I do brown or white, so I think they’ve acclimated. You’re well on your way! I discovered this recipe several months ago, and it has since become a “go-to” in our home. Easy, simple, delicious. I follow your advice and buy brown rice in bulk, and make my own stock. Good and cheap ?